Many organizations have installed Microsoft Exchange and use the electronic calendar in Microsoft Outlook as their central monitoring and planning tool. This has led to greater efficiency in working together. WebTeam Central - our web based Team calendar - offers even better opportunities for increased productivity and improved customer service. 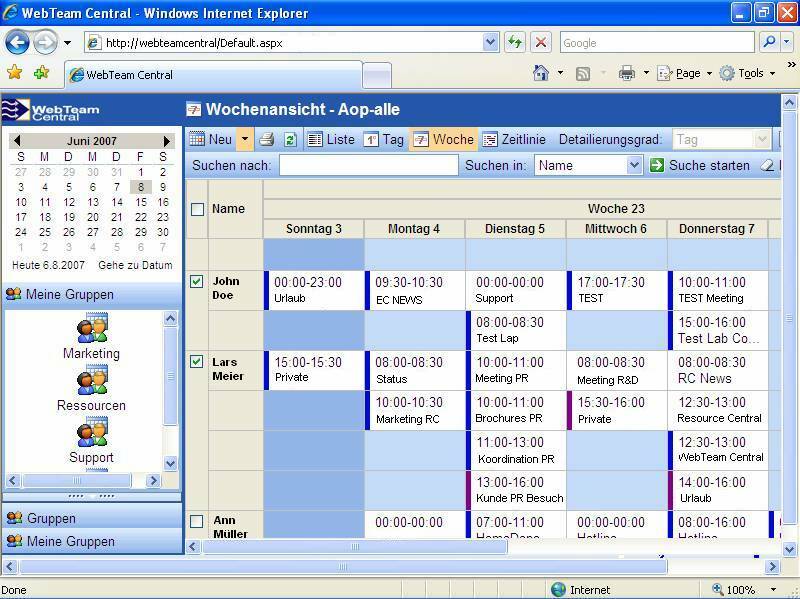 WebTeam Central gathers the appointments from other Outlook calendars and gives companies and users the ability to collaborate regardless of the whereabouts of the individual user. The features are utilized through an Internet connection and a browser - this complies fully with the 'Microsoft Way' - seen in Outlook Web Access. WebTeam Central also fully complies with the security and permissions granted on the Microsoft NT/2000/2003/2007 Exchange server.